This Collection is the result of “genetic mutation experiments” between the iconic languages of pagodas and flying saucers. It’s characterized by its contrasting negative and positive shapes. 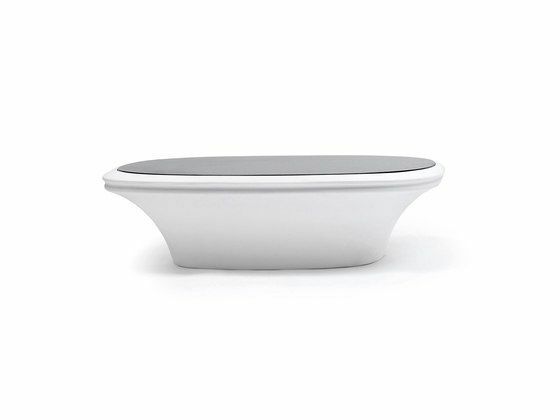 Having this creative focus originated a collection inspired in the fluid and sculptural monolith Martha Pan, which encourages relaxation and comfort. A new stool, chair and chair with armrests are added to this collection, which along with the UFO armchair, table and sofa can create different combinations which are very adapted to exterior places because of their elegant shape and their materials which are resistant to open air use and inclement weather. The colours, with possibilities of different finishes and interior illumination widen the scope for transforming enviroments. Stefano Giovanoni, architect, industrial and interior designer, lives and works in milan. He works as industrial designer designing many iconic best sellers and commercially succesful products.